Here is a video I shot to show basic soldering skills for a mini-Deans connector. I thought i would add some photos of the custom elevator. Post below if you have any questions or comments. Or list some building technique you would like to see. I am going to help with a beginners balsa airplane build thread soon, I thought i would share a few simple build techniques. After 5 years of flying Cubzilla with over 1500+ flights, it is time for a slight rebuild and recover. During glider towing, the tail really takes a lot of stress due to towlines getting caught in or wrapped around the tail. So I decided to upgrade it a bit. I am using the Freezer Paper shiny-side up. Here is the balsa building board. The back of ceiling tiles works well too. Using pins on the sides to secure a part of the old tail that i plan to reuse. It is two strips of balsa with carbon fiber in middle, glued with 5min epoxy. A box to keep pins sorted. This is enough to build a 40% plane! Closeup of pinning technique. Pinning through wood causes a stress crack in wood. Sides are better. 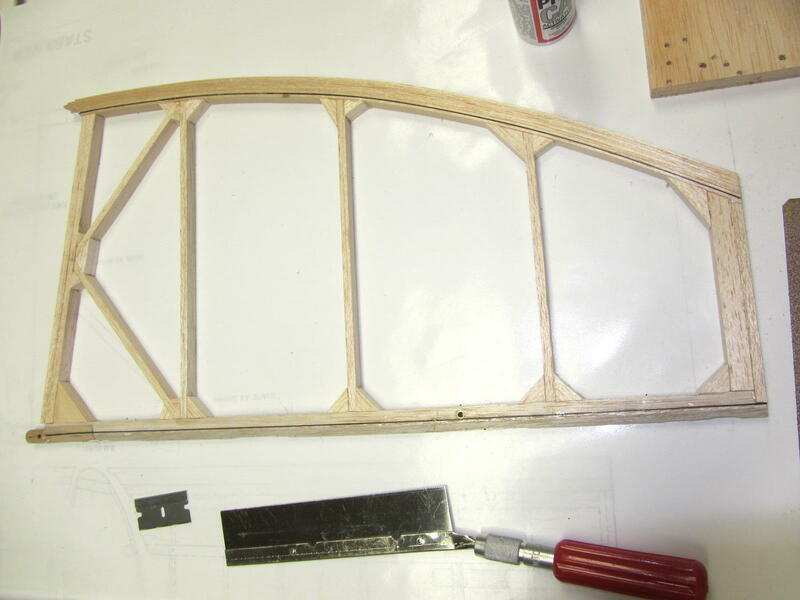 Closeup of horizontal tail trailing edge with CF going into dowel. I finally edited this video of me DSing in 2009. Estimated 65-100mph. I have decided to share my experience painting a EPP/EPO/Elapor/Z-Foam airplane, the Multiplex "Fun Cub." It's very easy and can be done with minimal investment. I have used an IWATA airbrush gun with Createx water based t-shirt paint, but you could use a variety of spray can paints, like Krylon H2O series. Just be careful as some paints will melt the foam. Test first! I purchased my airbrush gun(s) and paints at a local Hobby Lobby craft store. Hint, don't forget to print off the 40-60% coupon on their website. The box fan, air filter, and air compressor was purchased at Lowes. I'm no artist or painter! However, using my simple technique, you will find it is very easy to customize your plane, it's easy as 1-2-3. One more note about Createx paints. They are extremely durable and last for years, with one exception. You cannot put any tape on the paint, it will pull it off. So you will notice that i plan ahead with the taping so that i never tape over an already painted area. There are ways to overcome this glitch, but it is much easier my way. Btw, this painting project took about 10hrs to complete including taking the photos. Custom painted Multiplex "Fun Cub"
Here are some of my painting supplies. IWATA Eclipse HP-BCS paint gun, cleaning pot, Createx paints and cleaner. DANGER! Only water-based paints only. Box fan with 20x20 pleated filter to catch overspray. Fan on low. Dewalt "Oil-less" air compressor. Regulator set between 40-60psi. Auto paint supply masking paper and 3M auto masking tape. Createx t-shirt craft paint cleaner. This is my latest ARF-bash, an eflite Taylorcraft 450. I use "Permagrit" Sanding sticks. If you build or repair models, these sanding sticks are invaluable! They also work on EPP foam very well. Perma-Grit design and manufacture Tungsten Carbide grit abrasive tools for the Performance Car, Boat and Aircraft market. Our tools are renowned for their longevity and ability to work modern composite materials – Carbon Fibre, Kevlar, Glass Fibre, Perspex, Plexiglas, Lexan, Acrylics, Plastics and Polystyrenes and more conventional materials – Woods, Ceramics, Stone, Marble, Glass and Metal. Designed and used by Hobby and Prototype Model builders and high performance Aircraft, Boat and Formula 1 Racing Car manufacturers around the world." This is an incredible video! Skip Stewart and I are old friends. We both went to MTSU. He taught me to fly RC aerobatics and I taught him to fly full-scale aerobatics in a 1947 Bucker Jungmann & 1991 Super Decathlon. I was working for Leo Loudenslager (Laser 200) as a mechanic and introduced Skip to the airshow business. He certainly has progressed well beyond my level. Great job! Parkmaster midair with TaxiCup and I wasn't flying either one. I did test flight and radio setup for fellow FoamBuster. Easy flying plane. Flying at the dam in December. Multiplex Park Master 3D gets airbrushed! I just finished my first ever airbrush project! It was well over my skill level but I learned a lot in the process. I can't wait to paint another one! Lesson#1, paint before you finish and fly plane! I really like the ParkMaster! It is a fantastic little outdoor flyer. In my top 10 list of favorite planes. PS- Thanks to Donatas from www.donuts-models.com for the SUltimate scheme inspiration! Multiplex Park Master 3D EPP first airbrush attempt. Fun! Axi motor with cooling fan. Here is some onboard footage of slope soaring, formation slope soaring, and dynamic soaring from www.hobby-lobby.com FlyCamOne2. This was an experiment if we could slope on 30ft rock side of dam and DS on 50' backside. It worked but a bit tight for laps and not much room for error! Oct 2008. Glider is 1.5m (60") "sixty" or "epsilon 1.5". Approx 23oz RTF. Mine was Not a DS version but mixed carbon fiber fuselage. Awesome all-around thermal, slope, DS glider! JR9303 2.4ghz and Spektrum 6200 receiver. You will see the whiskers in the video. Just learning to go fast in East TN. Not the best location for DS, but it worked. This plane, known affectionately as "Red Tips", crashed on slope in KY, May 2009. RIP. and I gave some rides at: www.chilhowee.com in the german 1957 Schleicher Ka7 Rhönadler sailplane and the 1960's vintage Czech Blanik L-13. Bucker overnight camping trip to Chilhowee Oktoberfest 2007 full-scale glider meet. Me giving rides in german 1957 Schleicher Ka7 Rhönadler sailplane. I also gave rides in the 1960's vintage Czech Blanik L-13 at Chilhowee TN Oktoberfest 2007. First flight and engine break-in. Several light aerotows after test flight. Zenoah GT-80. Original install with several modifications to firewall. Stock mufflers and break-in prop.